The following is a guest post from Joe Saul-Sehy who blogs at the creatively-named Average Joe’s Money Blog and is co-host of the 2 Guys & Your Money Podcast. When he isn’t reading Modest Money, Joe spends his time running marathons, playing board games, and following professional baseball. If interested in submitting a guest post, please read my guest posting policy and then contact me. Back in “the day” I shared a hi-larious estate planning joke with my clients: if you know what day you’re going to die, wait on getting your will until then (because any time before that is a total waste of cash). If you don’t know, do it now. I know, hysterical, isn’t it? Good news. We now have certainty. You’re going to die tomorrow. The Mayans have predicted (some say they didn’t but that’s total hogwash) that the world is going to end on December 21. That means we know exactly the day you’re going to die. We’d better get working. Before I introduce you to estate planning, here’s a quick caveat: I’m not an attorney, and I don’t know your particular situation. I just know that there’s doom on the horizon, so let’s outline the basics. Will – A will tells the court where your things should go. The phrasing there is important. “The court” will direct your assets with a will. If you want to eliminate court involvement, you’ll need a trust. Executor of your will – this person has many titles, but in essence, it’s the person who’s going to quarterback your estate. I’ve read about people who couldn’t decide who to have, so they chose two people to split the responsibilities. Don’t. If they fight at all (and it’s never about anything really important), your estate will be held up and could be drained by court costs. I witnessed one family fight over mom’s antique chair (mom had a $1.4 million net worth). Chose one person. Chose someone who is comfortable being seen as a jerk by the rest of the family. Your goal is to get it done. Durable power of attorney – This allows someone to take care of your financial transactions if you’re laid up in the hospital or otherwise unable to take care of them yourself. Patient advocate designation – This is the person who will speak with doctors on your behalf if you’re unable. If you have a medical pro in the family, that’s the perfect person. If you have kids, a guardian and conservator – Although these are technically two different roles, many people have one person handle their children and their children’s money. However, I had some clients who had friends who were great with kids but money slipped through their fingers. Therefore, they had a different person handle the money. It’s okay (and maybe advisable in that situation) to have two people, but realize, these people will absolutely hate each other. The guardian will need money and the conservator’s job is to question every expense. Those are the basic pieces of an estate plan. You may need more than these, but you should check with an attorney to find out. 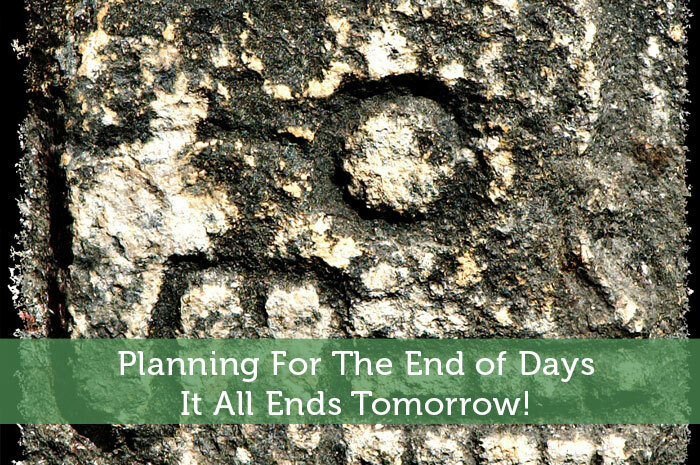 I just realized that if the world ends tomorrow, all of your beneficiaries will die, too! Problem solved! You don’t need any of this stuff! I know! All this estate planning mumbo-jumbo can go out the window tomorrow. I’m with you, Grayson. Do something you’d totally regret, were the world not ending tomorrow. It’s like a “get out of jail free” day. Ah! I’m getting crazy with comments in the wrong spots! We’re going to die tomorrow?! I should’ve planned better! Seriously though, good post Joe. We went through all of this about two years ago. We set one person as an executor as I’ve seen this exact issue tear a part of my family in two. It’s just nuts what family members will do when Mom or Dad dies. The fights that happen can be so stupid, can’t they? One executor is the only way to go. Thanks, John! Right! Who needs a pay raise two days from now? I’d go a step further: go tell your boss off right now. Use some expletives. Those will make it more fun. Better yet, do it drunk. Ha what a great way to introduce a somewhat morbid post. I definitely learned lots that I didn’t know about wills. Thanks for this! Thanks, Jordann! That’s actually what I told Jeremy when I proposed the idea. You rarely get a chance to present estate planning in a fun manner. Why not use the Mayans as an excuse? I figure since we are all perishing tomorrow, then why not spend all the cash today, drink a lot of beer and do whatever the hell we want? I mean, who is going to enforce it tomorrow? Fortunately New Zealand is already on the 21st and they have confirmed that the world has not ended yet. Hurrah! I think the major downside to this ‘end of the world’ thing is that 9 months from tomorrow there is going to be a baby boom, and they will have come from idiots! Haha, never thought of that, John: the idiot-boom! Seriously though, great post Joe! For some reason, I always zone out when reading out wills and estate-planning, but the apocalypse hook kept me interested and learning. New Zealand doesn’t matter. The Mayans lived on the Mayan peninsula in Mexico. That means their calendar runs on US Central time. And since the calendar ends on 12/21 (like ours ends on 12/31) the world won’t end until the end of 12/21- so really, we won’t know anything until it’s 12:01am CST 12/22/12. That sounds like an awesome way to spend your last hours. Time to go for the buttered popcorn (which costs nearly the same as the film….but who cares? Tomorrow we’re going down in flames). How long before the next world will end rumor? It seems like every few years, right? I remember visiting Sedona, Arizona when a group thought the world was ending that night. They all sat on a cliff together that supposedly was going to take off to a giant spaceship and save them while the rest of us burned. The next morning they had to come down and rejoin us heathens. Joe you are so funny. I love you. I love you too, L. Bee! It is another glorious day here in Guatemala, no end of the world in sight. The monkeys are hawling a bit louder than usual though, maybe they know something. Sometimes I think the monkeys are the smarter branch of our family tree, so maybe…. Instead of having a separate person to handle your kids money, wouldn’t it be easier to put the kids inheritance in a trust that spits out money from time to time and gives it to the kid when they become an adult? Side note: I remember listening to a This Week in Science podcast (best podcast ever!) last year where Dr. Kiki bought up the fact that researchers that converted the Mayan calendar to the modern one may have been off by as much as 50 years. So the world may have already ended and we don’t even realize it yet! It would be easier, but you’d then need a trustee to administer the trust. This could be the same person or a different person than the guardian, but it’d require more legal work and money management expertise. Here’s your excuse to just open it early, Jason. Tell them Joe said it was okay. The not so funny part is that many people do have this insight, but do nothing about it. Great point, Kevin. Sadly, as a young advisor, I fell into that trap. We were having twins and found out late that our insurance wasn’t going to cover the birth (talk about stupid oversight….). Luckily I was transferring regions and fell into an HMO, and therefore no pre-existing limitation on births. …that’s one of the reasons I take NOTHING for granted anymore. Great comment. Thx. You just saved me a lot of $. I had an appt with an estate attorney today, but after reading this, I cancelled it. AverageJoe, I was just talking with a coworker today about getting a Living Trust and was trying to explain to him the difference between a Trust and a Will. I’ve been planning to get one….do you think I still have time? But I guess it doesn’t matter if the whole world is going down tomorrow. The bad news is that if the Mayans are right, there clearly isn’t enough time unless you’ve got a pretty quick attorney. As I mentioned, a will goes through the court system and just directs them. Trusts (which I didn’t discuss much) can be thought of as a separate entity. Let’s say a trust is like a company that you set up before you die (well….you can’t set one up afterward, can you….). You create a whole set of rules about when funds leave the company and who gets them. You can even direct how assets are managed inside the company and who the manager will be. In fact, you can place criteria inside of your company documents that state when the manager could be fired and who should replace them. The limit is your imagination. When you die, that “company” (the trust) doesn’t die. As long as you’ve placed your assets under trust ownership AND had a will that said (in legalize) “everything that I didn’t place in my trust, please put it in today,” the company now operates as you’ve instructed, free of the court system (unless you have a type of trust that is controlled by the courts OR you run afoul of the law). Hopefully, that’s a good lay-person’s description of a trust (I know there are estate attorneys reading this cringing….). Trusts beat wills if a) you want to avoid a public estate; b) you wish to dole out funds slowly over time instead of immediately upon your death; or c) you have estate tax issues due to a large net worth. Mr. PoP had a call with Australia earlier today. It was tomorrow, and they were still there. Ah well. Well…we don’t know what time zone the Mayans were thinking, do we? AND what time of day. It could still be coming. I’m sure it’s on the way now…. As for the RE, there’s definitely nothing wrong with that. I personally don’t like thinking about gifting RE you worked hard to get to people/entities you didn’t intend. You’re right, you’re dead though, so I vote we just give it to me! HaHa such a great article. Whenever someone tells me the worlds going to end tomorrow I usually reply back saying it always does at 12 am. I guess we’ll all live to see another day. Thanks, Chris, although it’s still up in the air. I’m voting for the world to end around 11:55 eastern time. Crap, I need to get in there and open those Christmas presents before midnight. We have a will, but I often wonder if we need a trust. It’s not like I’m worth millions, but not dealing with probate seems like the way to go. If there’s nothing you’re worried about others seeing, I’m not a fan of the expense of a trust. Many states have streamlined their probate processes so they aren’t the albatross they used to be. That’s a great question for an attorney in your state (but remember that they get paid more to do a trust than a will….). I’m posting this at 12 AM Central Standard time in the US. Is anyone reading this…Anyone?…..Anyone? Rod, tomorrow it might be just you! See you there, Veronica! Save me a seat….. I was just watching a show about “preppers.” Watched for all of 3 minutes. Great article Joe, or should I say great translation! What’s generally available for the public to research on this subject is in technical language which tends to cause that glazed over effect someone mentioned earlier. Thanks! It really can be fun. We just need to find more crazy people to become estate planning lawyers…..
Haha! Good post.. Let’s hope that there are only a few idiots who blew all their savings on one last party…. I can’t wait to hear the stories about those people. Love ’em. Ha. Nice. My wife and I have a will, but I guess there’s a little more to it, huh? Only a little, TB. If an attorney did your will, usually everything I discussed comes in the package. Check yours to verify. Hey Joe! Great stuff. My wife and I have been procrastinating on this stuff for awhile and I know we need to get it done. My question to you: is it hard to use US Legal Forms for the financial DPOA, health care DPOA, and health care directive/proxy? Most people won’t have a clue where to turn if/when something happens to you (really “if” is wishful thinking, isn’t it? The only word there should be “when.”). You can pre-interview attorneys and have them draw up your documents so if you’re incapacitated/need help later/pass away your family will have a reliable place to turn rather than hunting for someone in an emotional state. I want to know now that my spouse and kids have a good attorney on their side to walk through everything they need when I’m not able to help.